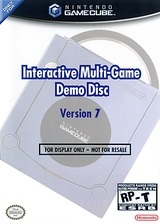 Interactive Multi Game Demo Disc v7 is a playable demo disc for the Nintendo GameCube. Playable games include Metroid Prime and Super Mario Sunshine. Video previews and features include Metroid Prime, Super Mario Sunshine, Star Fox Adventures, Mario Party 4, Animal Crossing, James Bond 007: Nightfire and an ESRB ratings commercial featuring Derek Jeter. Due to copyright concerns, Dolphin is unable to include official GameCube fonts, and instead uses Droid Sans. Unfortunately, Droid Sans does not align well with the size/kerning of the official GameCube font, which can cause text to be misplaced, dialogs to display improperly, and other issues due to differing text sizes. This can be corrected by including a region appropriate GameCube IPL (i.e. BIOS ROM) under <Dolphin User Folder>/GC/. A GameCube "IPL.bin" can be acquired from a real GameCube using Swiss. Refer issue 8362. GameCube BIOS files need to be named "IPL.bin" in order for Dolphin to detect them, and should be 2,097,152 bytes in size. IPL files are different for PAL consoles and NTSC consoles, but American NTSC consoles use the same IPL files as Japanese NTSC consoles. The known good CRC32 checksums below can be used to validate files, but it is possible that a bad dump with a different checksum also works. Without Store EFB Copies to Texture Only unchecked, graffiti doesn't affect Mario. The graph below charts the compatibility with Interactive Multi Game Demo Disc v7 since Dolphin's 2.0 release, listing revisions only where a compatibility change occurred. This page was last edited on 11 February 2018, at 14:04.